As a young child with his Bolivian father, Alejandro Medina recalls frequenting the back patio of the old restaurant Papagallo’s, where he admired the beauty of De La Guerra Plaza. Today, he’s the general manager of Bibi Ji, the hottest restaurant in Santa Barbara, and its patio has the same view Alejandro used to marvel at. Medina is extremely personable. I got to know him as frequent customer of Loquita, and I attributed a lot of that restaurant’s early success to his personality. 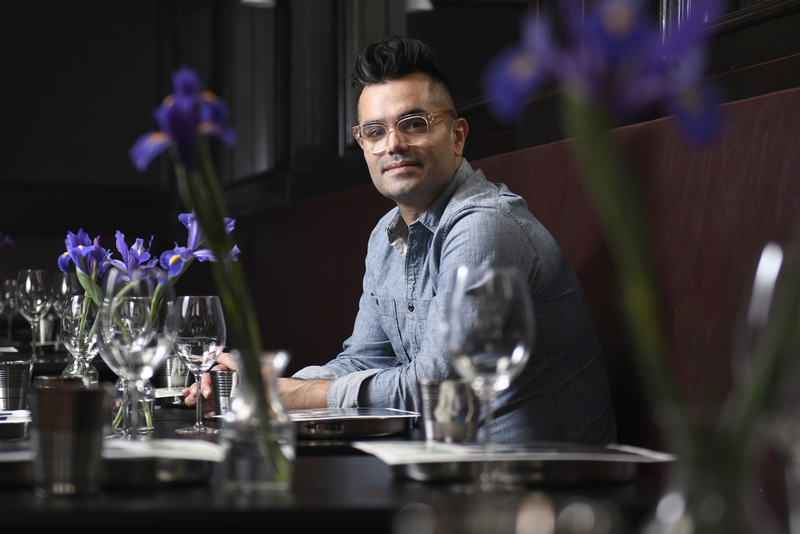 I told a friend of mine that Alejandro’s charisma, attentiveness, and enthusiasm are a perfect match for Bibi Ji’s attractive environment and extraordinary food, which fuses Indian and Australian flavors. Spicy, rich, flavorful smells greet you the moment you walk in the door. Alejandro buzzes around the room looking after customers with genuine warmth. As we sit for an early lunch at Louie’s, Alejandro explains that he doesn’t get a lot of down time – most days, he clocks in at 11 a.m. at Bibi Ji and clocks out 12 hours later. He’s excited about the second phase of the restaurant (after its much lauded opening), launching a new summer menu (that includes a succulent summer corn salad with chickpeas), and opening the front patio on State Street. What’s remarkable about Bibi Ji’s food is how the flavors and spices build with every bite. “Some curries start being cooked early in the morning,” Alejandro explains. “I’m learning so many new spices, seeds, and what this remarkable cuisine has to offer.” Bibi Ji is the brainchild of chef Jessi Singh, who was born in India and raised in Australia. Alejandro Medina answers the Proust Questionnaire. I have always been intrigued and inspired by early Latin Artists like Diego Rivera and Jose Guadalupe Posada. I think it was a very interesting time for Hispanics making their way not only to the United States, but the entire world. In a time when they were barely accepted and were creating powerful art that is still revered to this day. That to me, is fascinating. I still remember every Latin Folk Art class I took in college, and when I first learned that Diego had a studio in Santa Barbara, I appreciated his work even more. Passion. How they apply that to whatever it is they do shows a strong trait about who they are. Positive energy that passes on to all those around me. The ability to interact with guests in the restaurant is always my inspiration. Providing a service that creates a memorable experience is a great accomplishment. My Mother, for always being a strong woman: driven, focused, and loving. Enjoying great food, with great wines—and great friends. People who are passive aggressive, just let it go! Culture. No two of my friends are alike, and culture has always been something that intrigues me. To be more patient. The industry I am in is so fast paced that often as a person outside of the restaurant I forget to slow down and enjoy what is around me. Graduating the University of California with a Business & Economics Degree. My family, and my grandfather’s 1998 Cadillac. My nephews, Hollister and Hunter. If you’re going to start something, finish it.